Interest rates continue to be offered at 12 month lows! And for the first time in a year, Personal Income was reported higher than Personal Spending–meaning that as a country we are not living on credit for the first time since last Spring. Perhaps that is why we Americans are so optimistic about the future as measured by Consumer Sentiment, which rose higher than analysts anticipated. Some forecast that interest rates will continue to drop while others argue that rates have bottomed out and will rise from here as the Feds continue to sell off their holdings in mortgages. I can’t tell the future; what I see though is that since the Federal Reserve started slowing down their purchases of Mortgage Backed Securities in December, interest rates have dropped about 3/4%. Fickle? Unpredictable? Uneducated? Looking for words to describe the market’s reaction to a negative GDP reading for the first quarter of 2014. Gross Domestic Product is the mack daddy of economic reports because it says encompasses about every other report’s reach. Under normal circumstances you’d see stocks and rates plummet on news that our economy actually contracted over the last three months. Today, the inverse is true. Why? Is certainly is not because Pending Home Sales also contracted from 3.4% in March to only 0.4% in April. Crazy stuff. It seems that everybody is looking through those rose-colored glasses we were talking about yesterday. The S&P closed at another all-time high of 1911, and MBS crept to a new 12 month high as well. Today Stocks are down marginally while Bonds opened up, driving yields (interest rates) down further. I tend to be conservative with other people’s money and recommend locking in these great rates as soon as you get a chance, hence yesterday’s caution. But what the heck, you only live once; today I say let it ride and let’s get those 30 year rates back in the 3’s! Every report out today is positive and cause for a bright outlook. The Case Shiller Index shows that home prices rose 12.4% from March 2103 through March 2014. Consumer Confidence rose from 82.3 in April to 83.0 in May. And lastly, Durable Goods Orders rose 0.8%; better than the -1.3% that was anticipated. All of this sunny news only substantiates the S&P 500 closing over 1,900 last Friday for the first time ever. Meanwhile, Mortgage Bonds continue to command 12 -month-high prices, keeping interest rates nice and low. Thirty year FHA loans are still at 3.75% and Conventional loans are a bit higher at 4.125%. Fifteen year rates are down at 3.25% (APR will be higher, depending on the loan and down payment amounts, and amortization term–as closing costs and the presence of mortgage insurance affect each loan differently.) Be careful; the rosy picture cannot last forever. Existing Home Sales are up marginally for the April reporting period from 4.59M to 4.65M annualized units sold. These are an increasingly number of bonafide buy/sells and not distressed properties. A report out from Black Knight (not sure who that is) today shows that foreclosure starts have dropped 40% since April 2013. From someone who originates mortgages, this a great step in the right direction. On the side of the coin, yesterday Fannie Mae said that “the housing picture remains worrisome” in its release of the May 2014 Economic and Housing Outlook, citing year-over-year volumes declining with Existing and New Home Sales. They went on to say that they anticipate a “modest uptick” in housing as the spring/summer buying season progresses. Continuing the dour outlook, the Fed expressed concern about the employment prospects of those who continue to be unemployed. These pooh-pooh prognosticators are keeping the demand for mortgages high and interest rates low. Zillow reports that negative equity declined 18.8% during the first quarter of this year. That’s more people that can now sell the home they have had since 2007 to purchase something that they really want. There is a record number of Americans on disability right now at 10,996,447. After popping up above the record 1900 threshold a week ago, the S&P has been down as much at 2% but is now gaining momentum. That is cause for concern if you like low interest rates and you see in the above chart that pricing is bouncing off of the one-year-high price. If pricing fails to penetrate the ceiling of resistance and Stocks make another run at their top, we’ll see pricing fall and interest rates jump up from the current levels. Reports out today show that there are 3.5 million Americans who have been out of work for longer than six months. So be grateful if you had to get out of bed and come into the office this morning. 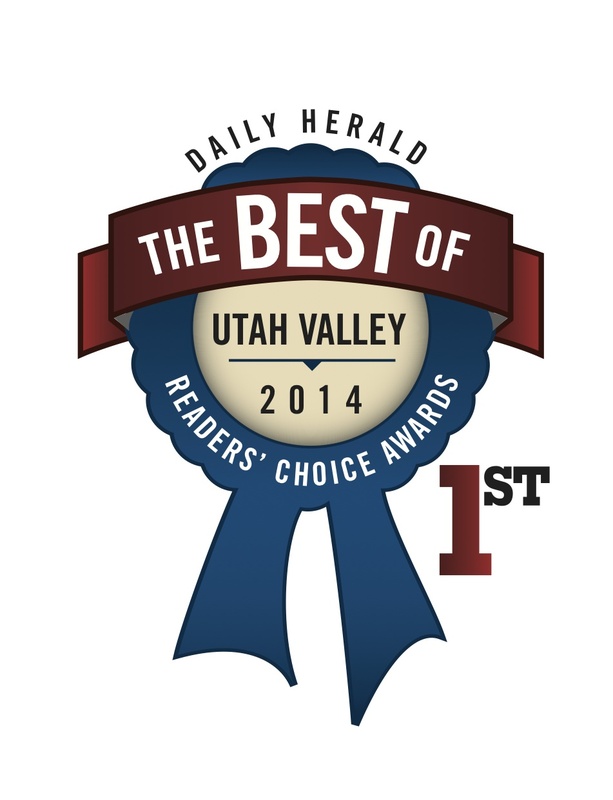 Thank you for voting my company the Best Mortgage Company in Utah Valley this year. I am fortunate to have the best clients in the State and really love helping families formulate and achieve their goal of home ownership! Bond pricing is up 13% YTD so far this year, the largest returns for that period since 1995. Higher price means lower rates! Speculation that monetary policy makers here and abroad will continue the current pace of economic stimulus is at the root of the gains. 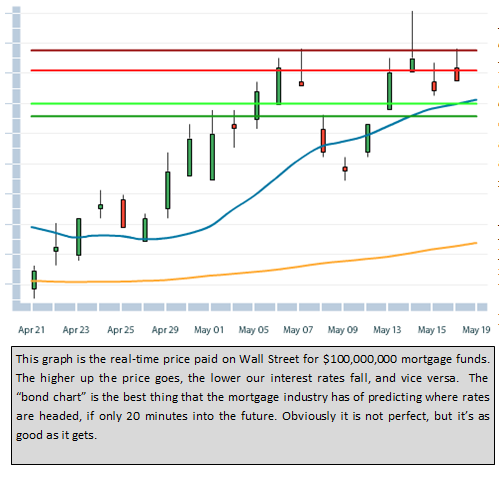 Mortgage Bonds have blown through all resistance levels and are currently at 12 month highs. Interestingly enough, today’s price is exactly what it was one year ago when rates were on the way up. Let’s hope that rates continue to trend lower! Freddie Mac has started allowing a one year income waiver again, meaning that certain well qualified borrowers can get away with only showing the previous year’s tax returns instead of needing the two year average. There is more to it than just that, but the fact that guidelines are loosening up a little is cause for celebration. Go buy yourself a new house. Case Shiller confirms that home prices across the country rose 11.3% in 2013 and anticipates that number to shrink in half for the 2014 year (don’t shoot the messenger). Speaking of lower prices: Retail Sales rose by just 0.1% in April, way under the 1.2% increase in March. So it’s a great time to go stock up on lots of stuff that you don’t need. The S&P Index just hit 1,900 for the first time ever before slinking back down under that mark.